Elumelu Foundation Opens Applications For 2019 Entrepreneurship Programme Jan. The management of Tony Elumelu Foundation, on Tuesday said it will begin accepting applications for the fifth cycle of its Entrepreneurship Programme at 12am, WAT, January 1, 2019 to select 1,000 applicants that will join the current beneficiaries of the Programme. Since 2015, the TEF Entrepreneurship Programme – the only African-funded entrepreneurial catalyst of its kind – has empowered 4,470 African entrepreneurs, with seed capital of $5,000 each; 12 weeks of accelerated online business training; access to experienced mentors; and membership of Africa’s largest entrepreneurial ecosystem. The Foundation’s investment, impact and commitment to advancing entrepreneurship, according to the statement, “is predicated on the belief that Africa’s entrepreneurs hold the key to unlocking the potential of the continent and facilitating the transformation of Africa. 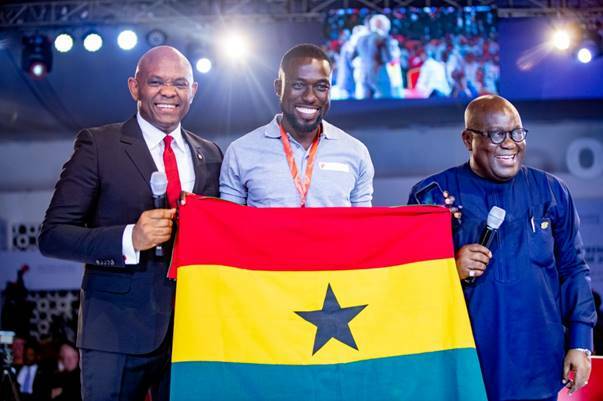 Photo Caption: Tony Elumelu, Founder, Tony Elumelu Foundation (left) and President Nana Akufo-Addo, President of Ghana (right), pose with a beneficiary (middle) of the TEF Entrepreneurship Programme at the 2018 TEF Entrepreneurship Forum.